If your head is spinning from all the information surrounding the newest tax update that’s taking effect for this filing season, you’re not alone. There’s been loads of misinformation floating around alongside correct information and it’s no wonder everyone’s floundering because they don’t understand how their taxes will work this year, mainly cause no one knows. Except for accountants that is and tax professionals in general. 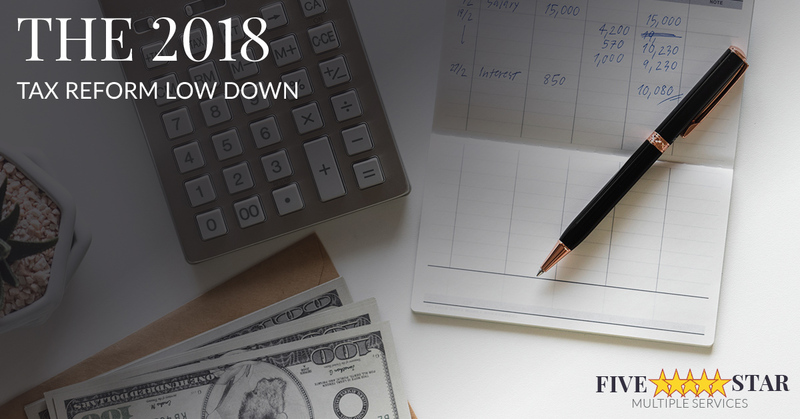 It’s our job to stay informed and provide you with the proper information that you need to be able to make decisions about how you’re filing this year and what you need to know about this new tax bill in general and how the government shutdown is affecting your filing process. That means that last years taxes were not altered by this bill even though it was passed last year. It only goes into effect this year. The tax reform we’re speaking of is the “Tax Cuts and Jobs Act,” and it mostly affects brackets. At least, that’s where the biggest reform took place as well as to marginal tax rates. Your marginal tax rates are defined as the percentage of your income you actually pay in taxes. That means that you income is actually taxed at a variety of rates, depending entirely on which tax bracket you’re slotted into. Your tax bracket has a matching tax rate in the sense of if you make $75,000 a year, you may think your tax rate is 25 percent, but actually a portion of your income would be taxed at 10 percent and the other portion would be taxed at something like 12 percent, another portion at 24 percent and another at 22 percent. What’s really interesting though, is that the tax bracket you’re in actually changes from year to year to account for inflation, however your marginal tax rate will only change whenever a new tax law is passed. For this year, that means you’re putting more from your paycheck away. This is because the 2017 marginal tax rates meant four parts of your income were each taxed at 10 percent, 15 percent, 25 percent and then 28 percent. This year, that has changed to 10,12,22, and then finally 24 percent instead. Another way you’ll save this year is if you’re married. There used to be an unintended penalty for married folks that were accidentally pushed into a higher tax bracket when they combined their income, now the married couple is simply dubbed a double filer, which means their bracket is simply doubled. After the tax overhaul took effect the treasures went to the books and made sure that you paycheck and pensions jumped initially. They dropped the rate employers were instructed to automatically withhold for their employees. The problem lies in that the treasury might not have properly calculated how much they should actually be withholding. Anyone who had large state and tax deductions in the past, you’re likely looking at a scenario where you’ve under withheld at no fault of your own. Generally, these mistakes turn into more tax bills for you at a less convenient time. There are also new limits on the average tax break which might leave some filers with higher estimated quarterly taxes due. These no longer exist until around 2025. Congress used the savings from no longer providing these the help expand other provisions like the child credit and standard deductions. Unfortunately, congress suspended or “limited” a variety of common write-offs. The standard deduction has been doubled to around $12,000 for single filers and $24,000 for married couples that file jointly. The standard deduction is what you can keep of your income that’s not going to be taxed. You can choose to use the standard deduction, or use an itemized deduction depending whichever one you believe will gsave the most money. You can create an itemized list of state taxes, mortgage interests and donations on your Schedule A. Most people will not reach that high of collective itemized deductions on their own, so taking the standard deduction will maximize your savings by quite a bit in most cases. That’s a hyperbole. The new tax reform merely takes away the opportunity for individuals to write off their tax-deductible charitable contributions. If you did them before August 27th, 2018 you’re safe. Otherwise, that won’t be an option. Additionally, “client charity” won’t be deductible any longer either. If your company doesn’t reimburse you for taking a good client of yours out to dinner and a ball game, it won’t be an option for you to write that off as a business expense on your taxes any longer. If you own your own business, it’s a bit better, but not by much. You’ll be able to still write off 50 percent of your business meals, but you won’t be able to write off any of your entertainment expenses. Don’t worry about your tax preparation headaches coming down the road with the tax reform. Let Five Star Multiple Services help you navigate the upcoming tax season and get the most out of your return. Contact us today.